I remember the moment, sometime in the mid-1970s, when my mom discovered pesto. What a happy day that was! She of course made it with basil, and since our family hadn’t been introduced to a food processor, she pulverized the basil with a mortar and pestle. So exotic, as if we had been let in on a mysterious culinary secret. We ate pesto often, always on pasta, and never tired of it. I continued to make pesto when I left home, but I cheated and used a food processor. When my daughter, to my utter befuddlement, turned into a “picky” eater, pesto saved the day. She loved it, despite the bold flavors. I could put pesto on all of the beige food she ate, and convince myself that she was eating her vegetables. She is now one of the most adventurous eaters I know. I like to think that pesto allowed her taste buds to embrace more complicated flavors when the time was right. Can pesto be made from anything other than basil? Yes! 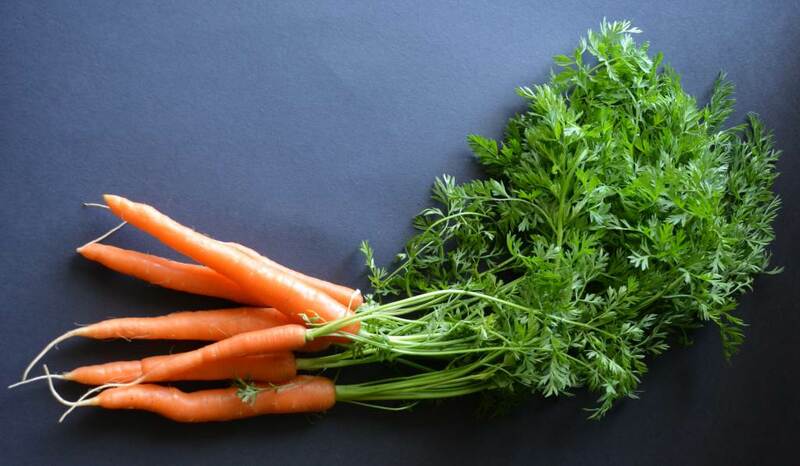 The possibility that carrot tops could be eaten by any species other than rabbits came to me when I started shopping at our local farmers market. I was often accosted by a strange woman wearing a face mask. She appeared out of nowhere, as I was purchasing carrots, and always asked if she could have the tops. I thought she was a bit off her rocker, and imagined her going home to make a carrot-top witch’s brew to cure an ailment. Now I think she may simply have been ahead of her time, and went home to make carrot-top pesto. I don’t give the tops away anymore! 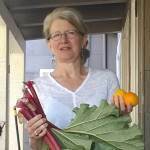 There is something wonderful, almost virtuous, about eating a vegetable top to toe. 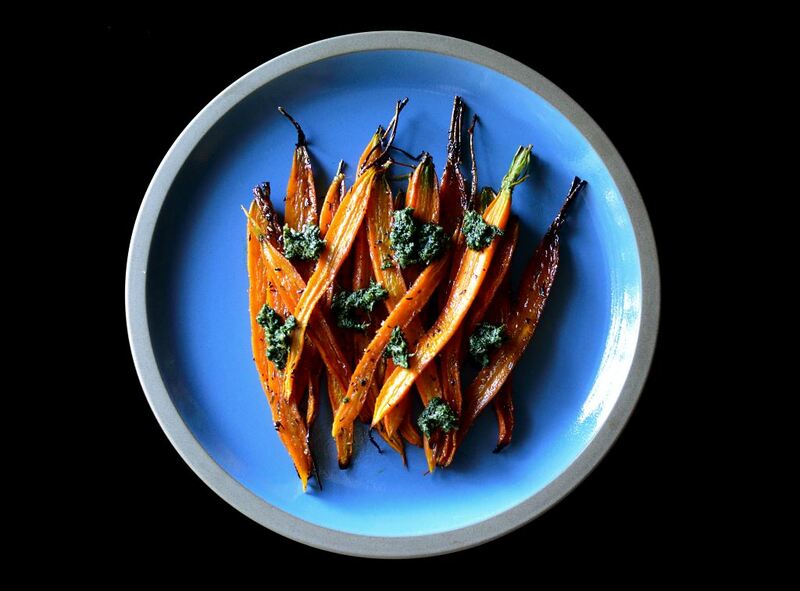 Roasted carrots with carrot-top pesto are as tasty as they are visually appealing. Like basil pesto, carrot-top pesto is good on almost everything. It is good on all vegetables whether they are roasted, steamed, or blanched. It dresses up roasted chicken, sauteed scallops, and lamb chops. I sometimes put a spoonful in creamy potato soup, or a chunky vegetable stew. And if you have a picky eater at your house, it’s right at home stirred into a big bowl of pasta. 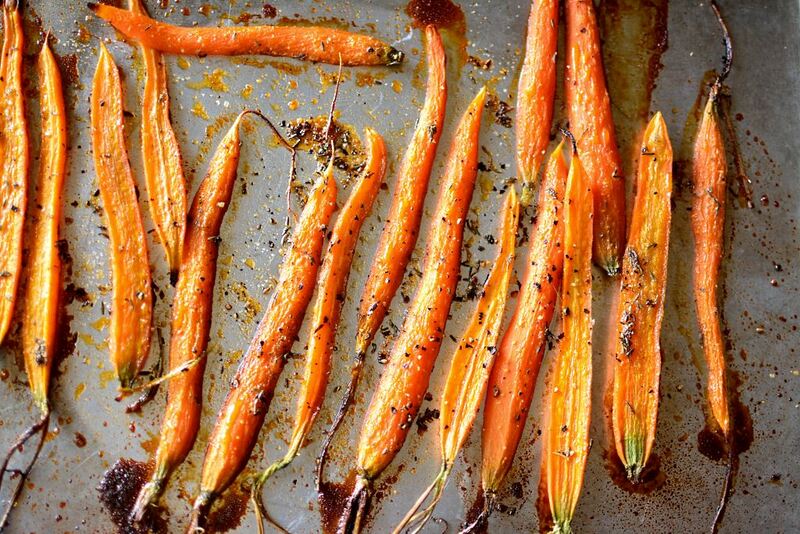 Coat the carrots in the honey mixture and then roast in the oven until tender and caramelized. 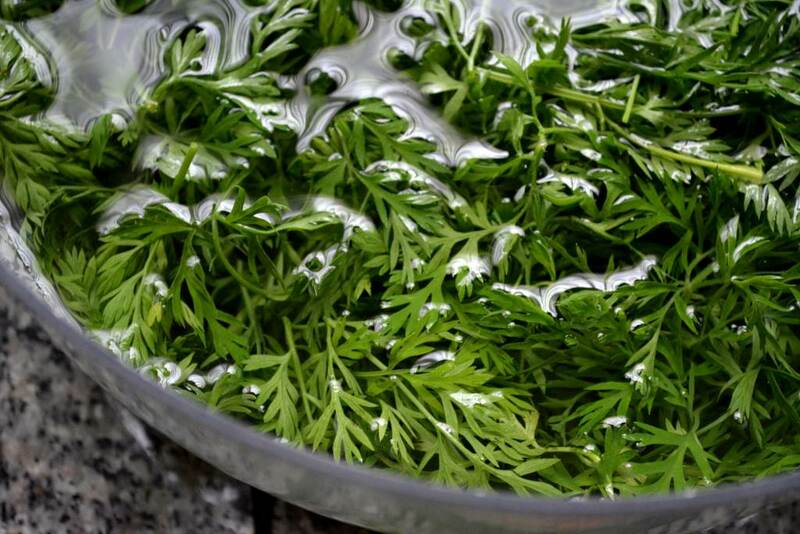 Wash the carrot tops in cool water. 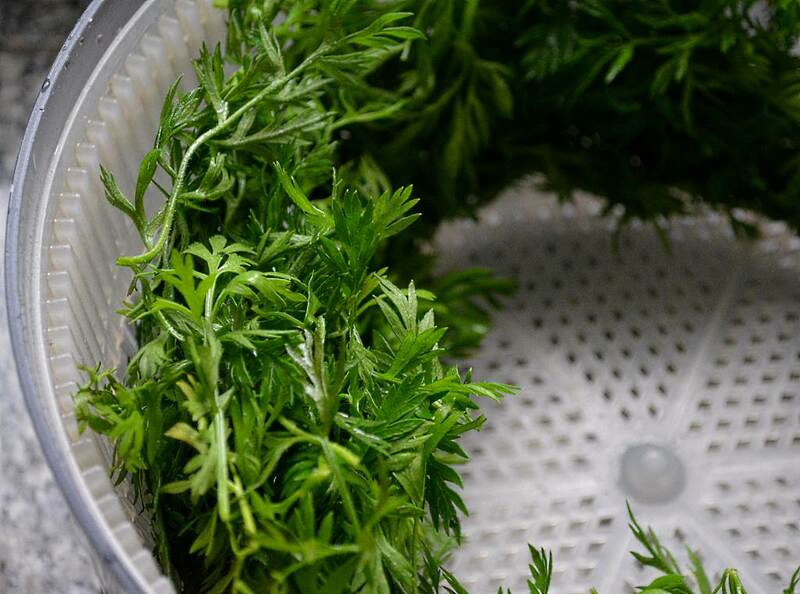 Dry the tops thoroughly in a salad spinner. 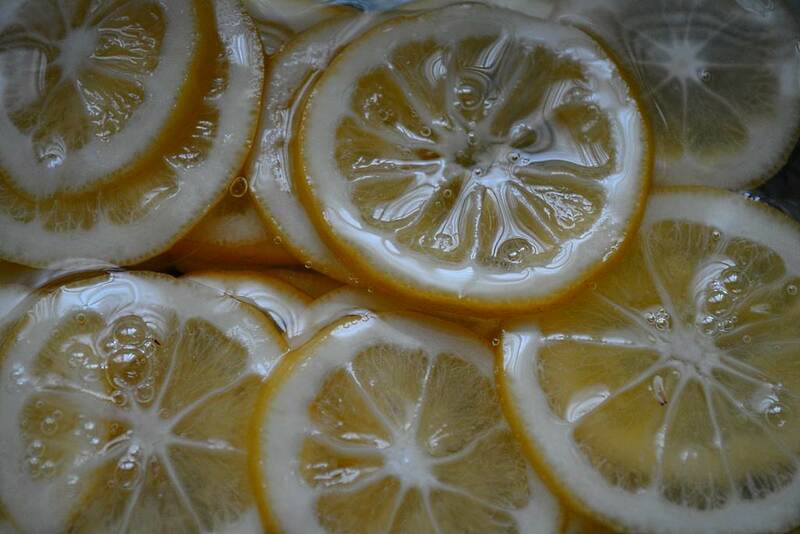 Rinse three Cured Lemon slices, and then coarsely chop them. Put all of the ingredients, except the oil, into the bowl of a food processor. Pulse the mixture until uniformly chopped. Add the oil and mix until fairly smooth. Mix together the honey, grapeseed oil, thyme, ground cumin, salt and pepper in a large bowl. Add the carrots and toss the carrots until evenly coated. 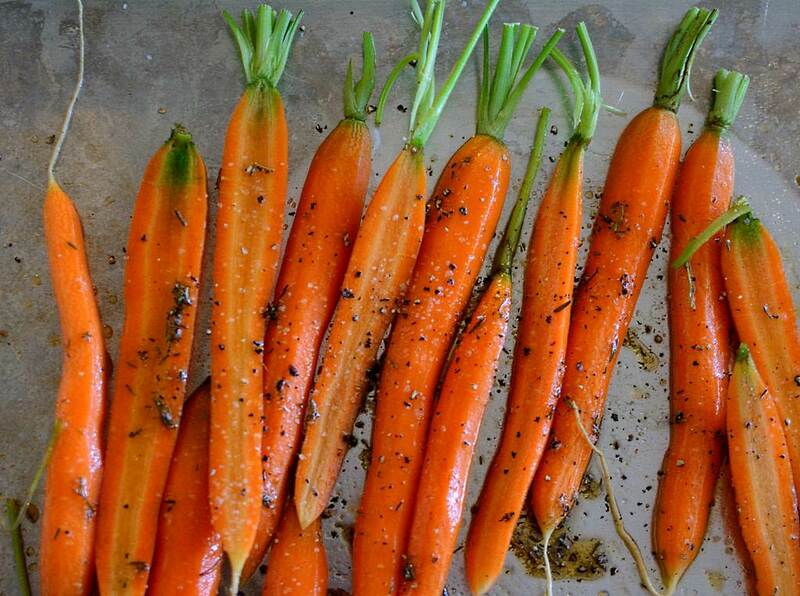 Put the carrots onto a sheet pan the spread evenly, so that no carrots are overlapping. Roast for about 30 minutes or until tender and slightly caramelized. The roasting time will depend upon size of the carrot pieces. 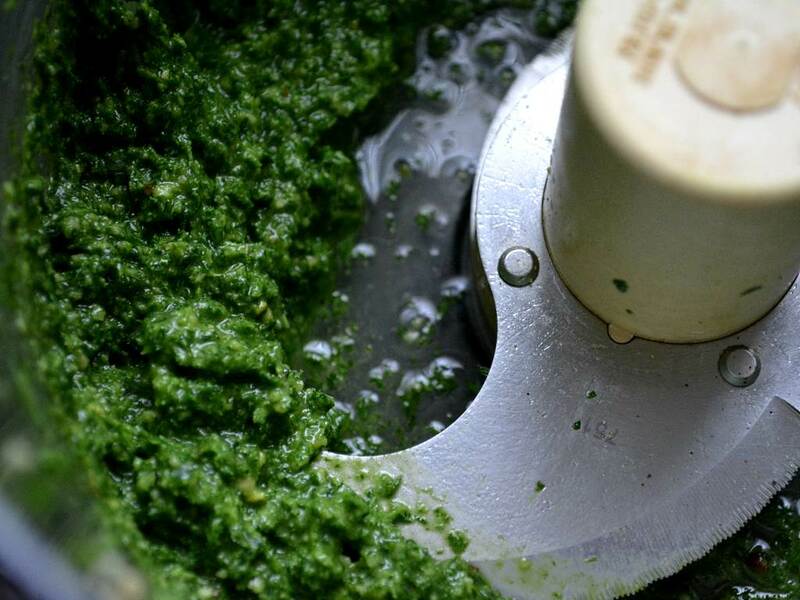 While the carrots are roasting, make the carrot top pesto. 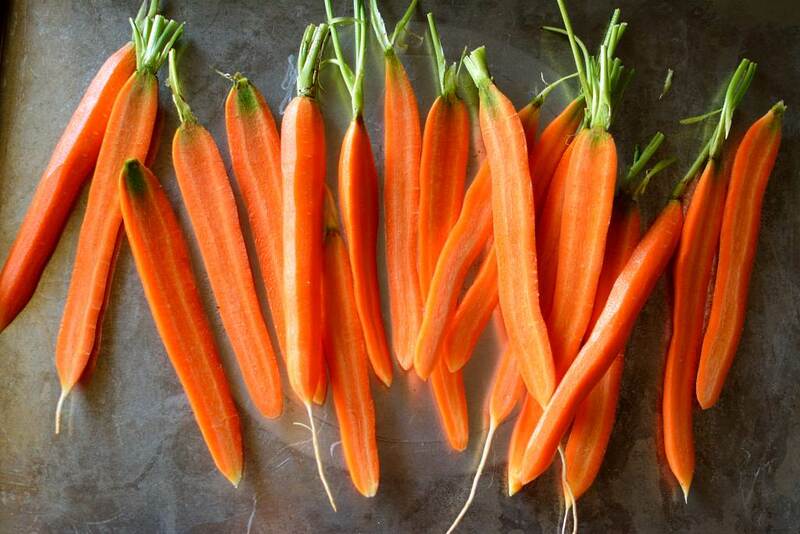 Rinse the carrot tops in cool water. Spin them in a salad spinner until completely dry. 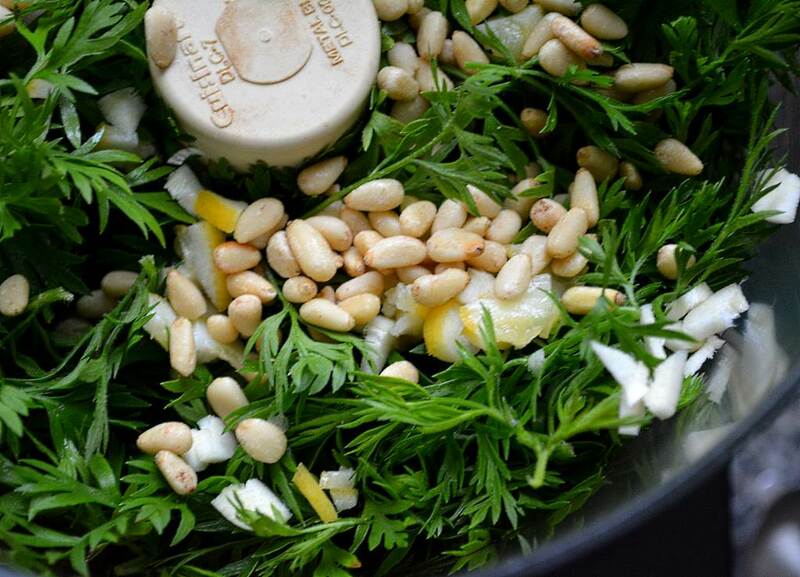 Place the carrot tops, garlic, pine nuts, cured lemon slices, salt and pepper into the bowl of a food processor. Pulse until evenly chopped, scraping the sides of the bowl as needed. Add the oil and process until smooth. Scrape the mixture into a bowl and fold in the parmesan cheese. 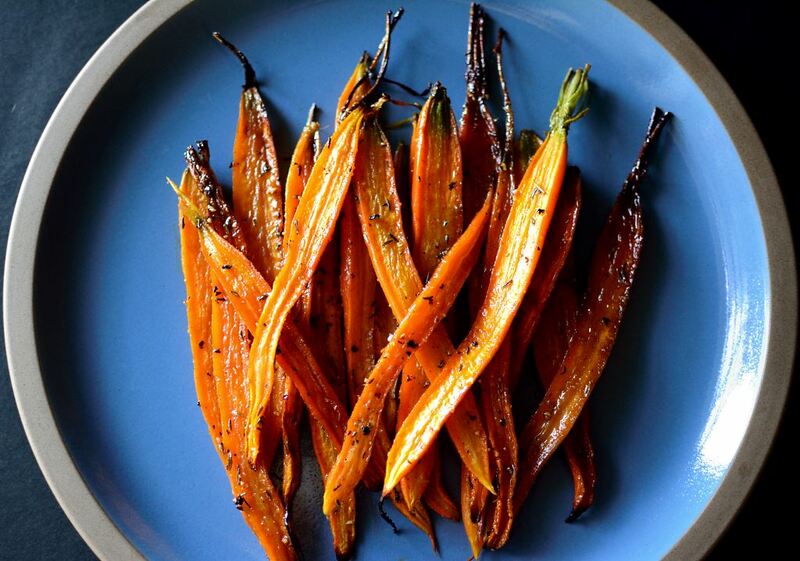 The carrots are good hot or at room temperature. If you have leftover pesto, it is good on almost everything–like this asparagus and cherry tomato salad. I love that opening photo. The carrots on the blue plate are very graphic. It looks like something out of a food magazine. Nice work! Thank you, David! That means a lot to me. I love your photographs, and your tips!! I have a lot to learn still, but luckily the practice is fun. We have a similar situation here, where I do the baking and many of the photos, but my husband does all of the post production. That still baffles me. Looking forward to seeing more of your work. 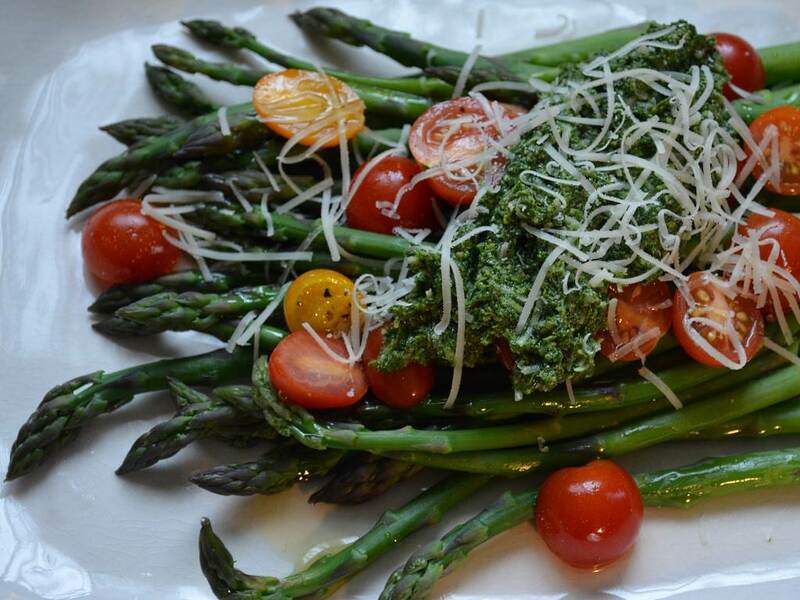 The asparagus tomato salad with carrot top pesto looks amazing! I agree 100% with David: the photos are gorgeous.